Developers are finding all sorts of nifty uses for the accelerometer in the iPhone and iPod touch. The accelerometer detects motion. It’s how your phone knows, for instance, when you’re shaking it while finding a restaurant with Urbanspoon ( ) or tilting it when you want to scroll text in Instapaper ( ). 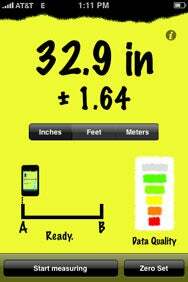 Measurements on the Fly: AccelaRuler gauges distances by detecting your iPhone’s movement. With AccelaRuler, developer Geoff Chatterton puts the accelerometer to use as a virtual tape measure. The results are mixed. Operation is simple enough. You place the iPhone at one end of the distance to be measured, tap a button, slide the phone the length of the distance, tap again, then slide it back to its original position and tap a third time. The buttons and readout are usefully large. The developer makes it clear to potential buyers that AccelaRuler has some limitations: only use it to measure flat surfaces, and only expect accuracy to within 2 percent of the actual distance. Fair enough. But the claim that AccelaRuler can be used to measure distances “to 15 feet or more” is questionable. To get optimal results, your slide needs to be roughly the same speed in both directions. For any distance longer than your own wingspan, this presents a challenge. Six attempts to measure a 94-inch rug garnered results that ranged from 82 inches to 103 inches, with three misfires that AccelaRuler blamed (justifiably) on inconsistent slide speeds. Even measuring shorter distances effectively is highly dependent on your fine motor skills. It’s not always a trivial task to slide your phone quickly and then stop it precisely where you want it. Another difficulty arises if you’re using an iPhone 3G. Because of its curvy back, it sometimes won’t sit perfectly still, and AccelaRuler doesn’t like any unnecessary motion. And then there’s the issue—for those who baby their expensive gadgets—of sliding the device across anything. There are certainly times when a quick-and-dirty estimate of the size of a flat surface is all you need, and AccelaRuler can deliver that. But don’t throw away your tape measure just yet. AccelaRuler is compatible with any iPhone or iPod touch running iPhone 2.x software.